In The Dark is not only a top-notch mystery but a moving exploration of grief. Many so-called literary novels achieve far less and are by no means as impressive. Billingham produces an astonishing final twist to complete his most ambitious and most accomplished book. 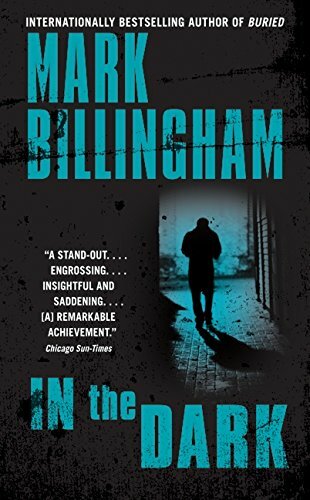 Ian Rankin had better look to his laurels – Mark Billingham is biting at his heels. Unmissable though the Thorne books are, this is the writer’s most ambitious work yet. Mark Billingham has (I hope temporarily) set aside his compelling series featuring Detective Inspector Tom Thorne and given us instead In The Dark, a stunning novel demonstrating an even greater mastery of his craft. I know of no other British writer with Billingham’s feel for the convincing dialogue of the crime world, whether it emanates from coppers, young black delinquents or ageing white gangsters from a bygone era. The final twist is brilliantly clever and shocking. In the Dark is edgy, pacy and frighteningly plausible. A story with a twist that I guarantee even veteran crime fiction afficionados won’t see coming. This engrossing story brings the darker side of London to life in stark shades of gray, elevating the standard cops and criminals fare to a level of social observation that is insightful and saddening. In the Dark is a painful, but remarkable achievement. Mark Billingham’s high standards for hard-boiled novels that mirror society rise several notches as he again proves himself one of the most exciting British authors working the crime fiction beat.